Energy Innovation forecasts an 11 percent increase in emissions based on Trump's change in vehicle emissions policy. UPDATE: After this story was published, Energy Innovation determined that its mortality figures were premature and re-released its research note, removing its forecast of deaths linked to the Trump administration's expected policy. In its initial analysis, Energy Innovation forecasted that deaths linked to the policy would top 13,000 by mid-century without California’s waiver and over 8,200 with it. The remainder of this story has been updated to reflect the changes in Energy Innovation's report. The Trump administration is expected to announce a pause on vehicle emissions standards this week, setting less stringent levels than Obama-era rules and revoking California’s authority to set its own standards. A forecast released Tuesday from clean energy advocacy group Energy Innovation suggests that the policy change will cost the country $457 billion. Those costs are fuel-related, and do not account for health implications. “It’s hard to overstate the foolishness of this move,” said Hal Harvey, CEO at Energy Innovation. 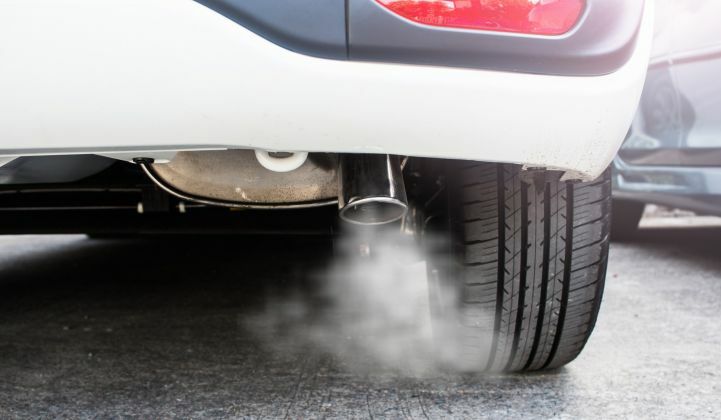 According to reports on the administration’s plans, Trump officials will keep fuel emissions standards at the 35 mpg fleet average required in 2020. The Obama administration had increased those requirements to 50 miles per gallon, or 36 miles per gallon in real-world driving, by 2025. The Trump administration’s rollback was widely anticipated after Scott Pruitt, then Environmental Protection Agency administrator, announced in April that an agency review of the standards determined they should be revised in a joint process with the National Highway Traffic Safety Administration. The plan expected this week would also do away with California’s waiver to set standards more stringent than national requirements, granted by the Environmental Protection Agency under Clean Air Act authority. 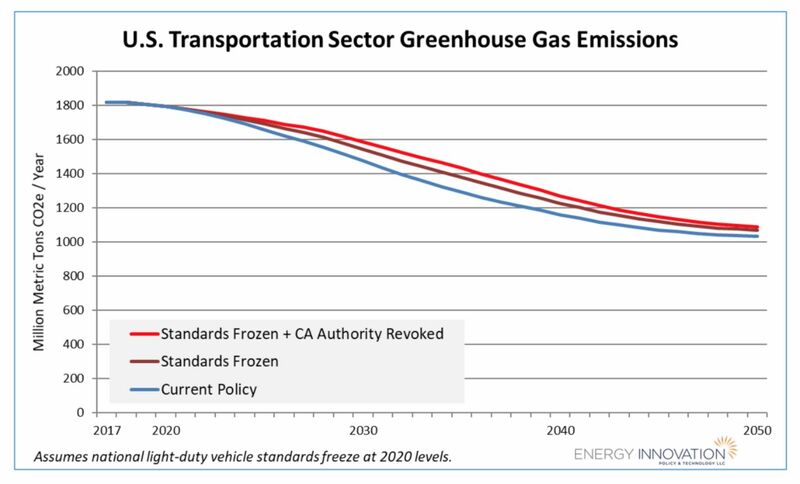 California’s policies also include EV targets. Since the administration undertook a review of the standards in March 2017, California has steadfastly defended its legal right to make its own policies. In April, California Governor Jerry Brown said the EPA’s plan to revise standards represented a "cynical and meretricious abuse of power [that] will poison our air and jeopardize the health of all Americans.” In May, the state sued the federal government along with 16 other states and Washington, D.C. Thirteen states plus D.C. use California’s emissions requirements over the federal standards. 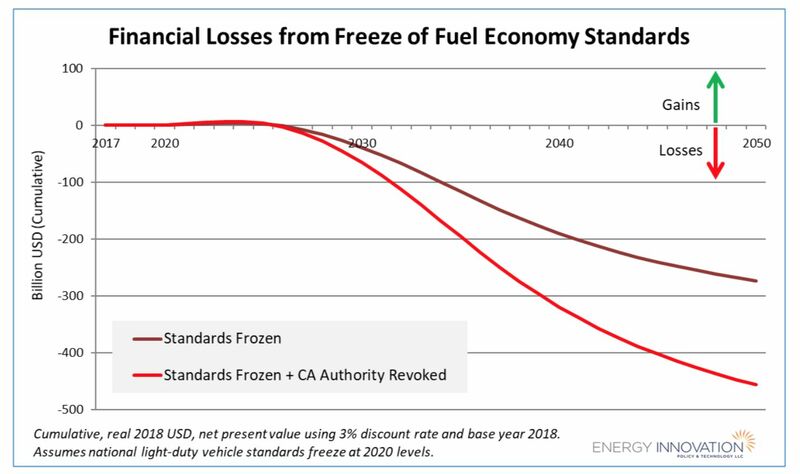 Energy Innovation’s analysis finds that economic losses will be most dramatic if the Trump administration revokes California’s waiver. While the policy will bring initial economic gains resulting from the reduced cost of producing less-efficient cars, around 2025 the policy will start costing the country money. Losses accelerate beyond 2030. If the administration leaves California’s waiver in place, the predicted losses will ring in at $274 billion. The organization’s calculation uses its open-source, peer-reviewed Energy Policy Simulator, which accounts for several sectors of the economy including transportation, land use, electricity supply, buildings, industry and agriculture. Modeled as a gas tax, Energy Innovation said the policy would top out at an added 57 cents per gallon in 2040. Loosening emissions standards would also inevitably increase greenhouse gas emissions. Energy Innovation expects the greatest increases in the 2030s, before electric vehicles undercut the share of gas-powered cars. In 2035, the group forecasts an 11 percent increase in emissions with a revocation of the California waiver and a 7 percent increase if the waiver is left in place. In addition to detrimental environmental and economic benefits, Harvey said the policy change will leave automakers in a bind. Though manufacturers have lobbied to relax standards in the past, they balked at a potential regulation freeze. Harvey said the Obama policy aligned federal standards with California’s stricter policies, making it easier for automakers to meet just one standard. If California’s waiver stays put, the U.S. car market will again be torn in two. Car manufacturers hoping to compete in those markets will have to meet the more stringent standards. Clarifying the uncertainty will likely be left to the courts. While the administration is already facing legal challenges from some states, the decision this week is expected to prompt more lawsuits. The two policy actions, freezing the standards and revoking California’s waiver, could find their way to the Supreme Court. Harvey said the courts may decide cases based on the merit of the policy change or defer to the executive branch. President Trump’s recent nomination of Brett Kavanaugh — or “Mr. Deference” as Harvey called him — to the Supreme Court may give the administration an edge.